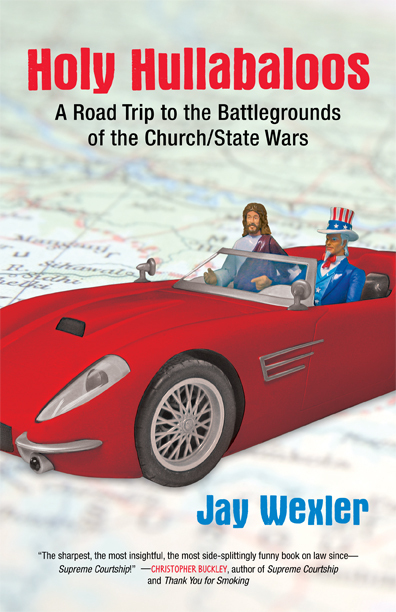 I am way overdue in suggesting that you buy a copy of Jay Wexler's book, Holy Hullaballoos: A Road Trip to the Battlegrounds of the Church/State Wars. At the outset, given that the FTC is now regulating blog endorsements, I guess I need to disclose that Jay sent me a free copy of his book, which, unless he goes around giving out free things for no reason to people he's never actually met, I assume he did in the belief that I would write a positive review of it if I liked it. So, please be advised that the author of this review has received what might be considered an in-kind exchange currently valued at approximately $13.60 from the author of the product he is reviewing, and incorporate that into your decision-making process accordingly. While I'm on that topic, I noticed that the FTC's website says it has its own blog, which I immediately planned to mock on the assumption I could catch it making an implied endorsement of something or other (most likely, the FTC). But if you go to the "FTC Blogs" page, what you find is not a blog but rather a link to what appears to be a PDF of a printout of a blog that the FTC once started but apparently lost interest in after about a week. I would be more comfortable with having the FTC regulate blogs if it had stuck with its own for more than five posts. Anyway, back to the book, which is a great read. Jay Wexler is a professor at Boston University School of Law who has also written very funny stuff that has appeared in Spy Magazine, McSweeney's, and many other places. You may remember "Laugh Track," in which he determined who was the funniest justice by means of counting up the references to "(laughter)" after each justice's name in argument transcripts. (Hint: it wasn't Justice Thomas.) This analysis, for which I congratulate him although I am frankly pissed that I didn't think of it first, was reported in the New York Times and on Nightline. 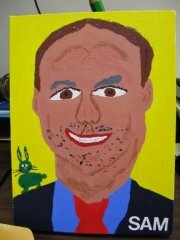 So he has a record of good comedy writing, although, as he would probably admit, he is a crappy painter. [H]e was telling me about a memorable encounter with an anthropologist in the 1970s, when suddenly from the back room came a burst of chanting and banging and other sounds of worship. Pichardo stood up and motioned for me to do the same. Pichardo's wife came into the living room, put some chalk on both of our foreheads, and then returned to the back room. We sat down a minute later when the chanting stopped and continued our discussion as if nothing had happened. Stuff like this happened all afternoon. The book also contains the sentence, "What are you, the Amish police?" which by itself would probably have been enough for me to buy the book, had I not already gotten it for free as clearly disclosed above. You, too, should either start a blog that might eventually convince Jay to send you a free book in hopes of having you review it, or — and believe me this is a much easier route — buy yourself a copy, which you can do here directly from Amazon via the author's website.